It is only a few months before we all get to see the final product of what Apple is codenaming iTV. But if you are like me, and you want something before the Holiday Season, you may be excited to hear there is a product out right now that will change the way you think about TV and your Mac. 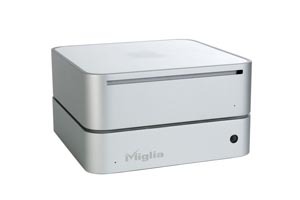 The TVMax by Miglia Technology is a digital video recorder that allows you to watch, record, pause, and rewind live TV all on your computer screen. So now, you can watch Monday Night Football right on your MacBook Pro. Or see the latest Iron Chef competition on your iMac. Basically, you have a Tivo unit on your Mac right? Not necessarily. It’s more than the simple DVR benefits of Tivo. The beauty of this product is once you have captured the content on your computer, you have complete flexibility on what you do with it. 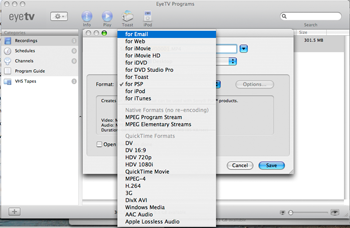 EyeTV 2, the software that comes with your TVMax, gives you options of one-click export to iTunes, iDVD, Toast, and your Sony PSP. So not only can you capture the show on your computer, but you can watch it on your iPod, PSP, DVD player, and your computer. After putting this unit through its paces, I am hard pressed to find anything critical to say about it. I have tested this unit now for over 2 weeks. In that time, I have recorded a few shows, captured old footage from VHS tapes, exported shows to an iPod, a PSP, and to a DVD. All tasks were completed flawlessly and painlessly. - Setup is quick and painless with everything you need to get started included in the package: TVMax Digital Video Recorder, an AC Power adapter with a slew of plug adaptors for every possible power source on the planet, a remote control, a USB 2 cable, a coaxial cable adapter, and the Eye TV 2 CD. - The TVMax shares the same footprint and finish as the Mac Mini so coupled together you have yourself a little stack of multimedia goodness. - Compression to MPEG-2, MPEG-4, and DivX formats are all performed within the hardware of the TVMax freeing up your Mac from the performance draining task so that you can do other things while you record. - Analog video inputs allow for connectivity and video capture from virtually any source: VCR, DVD player, Camcorder. Even video game consoles work so you now can share that great come-from-behind victory in Madden 07 with the world. - With the remote control (included), you can control virtually everything from across the room. Now you can be a couch potato and a computer chair potato all at once. - With Eye TV 2, editing out commercials is a snap—clipping out unwanted items can be achieved all within the software cutting out the need to run it through a third party before you burn to DVD. - But with easy export capabilities to iMovie, you can turn your childhood Kung Fu flick (previously only immortalized in VHS format) into a masterpiece fit for YouTube. Have other exporting needs? You can take your captured video and go to town with a huge selection of options. 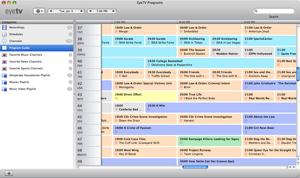 - Using Titan TV, a service that is supported by Eye TV 2, you can access online TV guides where you can sort any which way you want and schedule recording sessions. I tested all of these features with my 15” 1.25 GHz G4 Powerbook running OS 10.4.8 and had absolutely no issues. With great performance on this machine, I have confidence a G5 or Intel Mac would complete these tasks in a snap. Although the video quality showed some flaws at larger sizes, the default size of the video looked great on a video iPod and PSP. My only complaint was the lack of digital or HD support for video capture. Currently only an analog cable signal can be used. You can imagine the possibilities of a TVMax that supports HD cable, has the software support to edit the video, and the power to export to any possible format—you would never buy another TV show or DVD again. In my opinion, this is a must have for anyone with a video iPod. It’s easy to set up, a breeze to edit, and it doesn’t choke up your computer productivity. I give it a 9 out of 10. $249.95 USA, buy it here.